Vat Phou and Associated Ancient Settlements within the Champasak Cultural Landscape is a ruined Khmer Hindu temple complex interacting with its natural surroundings. The whole was created within a geometric framework linking man-made works with natural phenomena, notably the summit of Phou Kao and the river Mekong. The landscape is located in southern Laos. There was a temple on the site as early as the 5th century, but the surviving structures date from the 11th to 13th centuries. The temple has a unique structure, in which the elements lead to a shrine where a linga was bathed in water from a mountain spring. The site later became a centre of Theravada Buddhist worship, which it remains today. Southern Laos has always been pretty difficult to access. Things are changing here too however, albeit slowly. I was happy to discover a direct flight from Ho Chi Minh City in Vietnam to Paksé (the main transport hub in South Laos). Lao Airlines started this only last year, and I wonder how long they will continue it as there were only 20 passengers on my flight. Paksé itself feels unbelievably quiet and slow, especially when you’ve just come from Vietnam as I did. You can easily walk in the middle of the streets in the center of the town. A brochure at the Lao Airlines described it accurately: "it's no chaos, it's Laos"! As I had plenty of time, I decided to give it a try to get to Vat Phou by public transport. Guidebooks and internet fora could not supply me with clear directions how to do it. So I started out early (before 7 a.m.), looking for a songthaew to Champasak. To cut a long story short: they do exist, but will go only later in the morning when the people from Champasak have finished their sell and shopping at the market of Paksé. I ended up chartering a whole songthaew, together with an Italian guy who was stuck too. We arrived in Champasak just before 10 o’clock. I hired a bike for the remaining 8 km’s to Vat Phou. 10 a.m. is already pretty hot in Laos in March. Fortunately the road is well-paved, flat and just straight ahead. 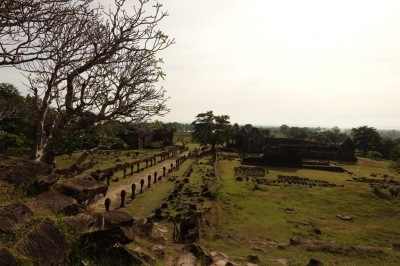 Vat Phou is a large complex. There’s an archeological museum at the entrance. Some lingam are shown here, and other objects found at the Vat. It’s just one room, not very spectacular. Then it’s a couple of hundred meters more to the archeological complex. I could take my bike with me (buses also go there). It all is in the open field, very little shade. The complex is made out of 3 parts: one lower, one middle, one high. The parts are connected by steps – many steps, steep steps, sometimes dangerous steps. You’ll pass redheaded tourists taking a break on stones by the side of the stairs. And we all endure this to get to the highest point, the ceremonial complex. But the lower area I found more impressive: the old processional walkway, with great views of the linga-shaped Phou Kao mountain and the frangipani that surround the stairs going upwards. And then I had to get back to Paksé. This is were all of the guidebook directions go silent. The answer is: there is no public transport from Champasak to Paksé in the afternoon. At least, no one was able to point it out to me. I asked around in a number of guesthouses, but all that they came up with was “early tomorrow morning”. So I had to improvise a ride back. I planned to just stand by the side of the road in the right direction, and just try every passing vehicle. Fortunately I did not have to – I walked into one more restaurant to ask for transport to Paksé, and found a driver and a guide who were just “delivering” their 2 guests to a boat. They had to return empty to Paksé, and were all too happy to take me along (for a little money of course). In hindsight, I think it’s the best to stay overnight in Champasak, and head for Vat Phou early in the morning. It’s an atmospheric site. Thanks to Lao Air and their weird flight schedules, I managed to visit Vat Phou during an overlay on my way to Siem Reap (Angkor). I arrived in the evening and stayed in a hotel on the outskirts of Pakse along the Mekong River. From there I went by cab the next morning to the site. The temple is built along the slopes of a mountain, quite scenic when you approach it. First you pass a long baray. 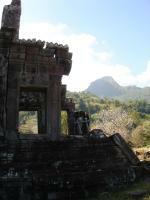 At the end of the baray you arrive at the big temple ruins which boast nice stone works. Climbing plenty of stairs will take you first to the mid and then to the upper level where the holy spring is. As pointed out by Els some steps are downright dangerous as they are way to steep and narrow. You get some great views of the site as you climb. Around 9 a.m. I had reached the upper level with the spring. In the meantime the temperature had already become unbearable, so instead of roaming around I decided to descend. After a very brief stop in the on site museum (no AC, worse than outside) I headed back to my ride. There are several other components scattered around the main temple complex, e.g. ruins of an ancient town. Seeing the site is title “Associated Ancient Settlements” my hunch is that these are also part of the inscribed area. The little I read seemed fairly interesting to explore. But the weather and me having to get back to the airport took that option off the table. The central hub for the area is Pakse which boasts an international airport. Specifically, you can fly to Siem Reap. You could even manage to visit Vat Phou as a single night excursion from Siem Reap, assuming you have a multiple entry visa for Cambodia. There are also daily flights to Vientiane and direct flights to Luang Prabang. I managed to book a flight from Phonsavan (Plain of Jars) to Siem Reap with overnight stops in Vientiane and Pakse for 180€. Pakse is also well connected by bus. However, it's stuck in the South Eastern corner of Laos, so getting anywhere in Laos by bus will take some time. From Pakse you can join a tour or take a public bus to Champasak (2h). In my case, being short on time (flight for Siem Reap left at 13:00h the same day) I opted for a car with driver. The road to Champasak is in good condition; they even have modern toll booths along the way. Travel time one way is less than one hour. I was picked up at 7:00h and we arrived before the official opening hour at 8:00h. You can even enter earlier, but then the ticket price goes up 10% (55.000 vs 50.000 Kips). I booked the car via my hotel for 60 USD. A travel agency in town offered the ride for 75 USD. My hunch is that you should be able to get a driver for 50 USD including all costs, but I didn't want to take chances. Pakse is the gateway for Si Phan Don (4000 Islands) and the Bolaven Plateau. It should be noted, though, that the area around Pakse has an increased Malaria risk and Dengue fever has also been recorded. In any case I would recommend taking in the sunset on the Mekong the night before. Stellar. I traveled from Pakse to Vat Phou by motorbike. The countryside was very beautiful and interesting... The villages we passed looked like people were living as they had been living for hundreds of years. Vat Phou itself is small and demure compared to the majesty of the Khmer cities in Cambodia so I recommend seeing Vat Phou first as kind of a preview of things to come in Cambodia. Southern Laos is famous for its cultural diversity and natural beauty especially many beautiful waterfalls, but traveling in this region can not be completed if not visited the 1,500 years old Khmer ruin, Vat Phou, the second Khmer heritage in the World Heritage list. Vat Phou is very important as it is one of the first stone buildings built by ancient Khmer and served as the main temple of the early capital of Chenla Kingdom which is the predecessor of Angkor Empire in present-day Cambodia, but that was not the main reason made Vat Phou to be accepted by UNESCO. Vat Phou is a part of Champasak Cultural Landscape; the center of the landscape is a lingam-liked mountain. Since ancient Khmer were Hinduism, the lingam-liked mountain had to be regarded as the symbol of god deserved to be worship by constructing the temple for. Moreover behind the temple has spring, the holy water from Lingam Mountain!, with the clever ancient engineering, Champasak people built waterway to let the spring flow pass the small man-made lingam in the main temple building before the spring flow down to the reservoir in front of the temple complex. For ancient pilgrims, Vat Phou was the place where they could receive the blessing from God via the double passed lingam spring (double holy). I have to admit that after read UNESCO evaluation and other study reports, my imagination on this place go far beyond the reality. Right now, Vat Phou is a ruined complex with only 3 buildings that are still standing hardly testify your imagination, the story of the double holy water is very hard to contemplate the possibility of existence. Actually I can not find any lingam since Vat Phou has been converted to become a Buddhist temple long time ago. In reality Vat Phou can not be competed with other important Khmer ruins like Phimai or Phanomroong in Thailand or Preah Vihear in nearby Cambodia (all are in UNESCO tentative list) and surely Vat Phou is disappointing if you visited those sites before. However, please do not consider I do not like Vat Phou and the lingam mountain; they have their own charms with serene and holy atmosphere which are surprisingly existed, so if you visit Southern Laos, there is no reason to not visit this place, it is the must and you can not find any important Khmer ruins that is so peaceful, solitude and less tourist like Vat Phou (except other forgotten sites in Cambodia) and that's alone make Vat Phou special. I visited Champasak in 1996 with my family who are originally from there, from a little village called Ban Dou. It was the first time for me and over twenty years for my Mother and Aunt. After arriving in Vientiene, which we stayed with my Uncle's relatives for a few days, we booked a flight down to Pakse which lasted about 45 minutes and then crossed the Mekong River by ferry to Champasak. I have heard they have since built a bridge that connects the two sides and you can now drive across. From there we drove to my mother's village which is about twenty to thirty minutes and is located on the main road, which its name has escaped me. Unfortunately we did not see Vat Phou or toured the main city of Champasak, but stayed in the countryside. It's so beautiful there, the sky is so blue and the clouds are so white and puffy and at night the stars are endless, because there are no bright city lights to shadow them. We stayed in Ban Dou for only two weeks, and for me it felt like it was only a few days. There is so much to take in, by just walking along the main road down to my grandfather's rice patty to walking with a bunch of my cousins down to the little stream and taking a swim. I savored every moment and it would take a book to tell you all the things we saw and did and felt in only two weeks. It wasn't seeing the main attractions for me really because we didn't, like the waterfalls and Vat Phou, it was being close to family. 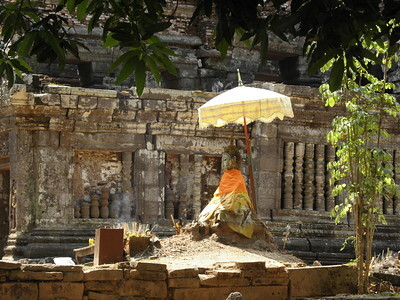 I plan to visit there again in the near future and this time I plan on visiting Vat Phou and all its glory. Human Sacrifice: Crocodile Stone "may have been used as an altar to perform an annual human sacrifice"